Designed by Robert Kalina, show generic architectures typical of the different European artistic periods. 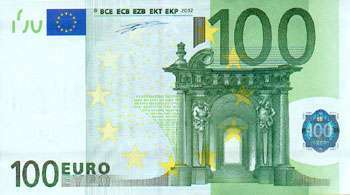 The hundred euro note shows the Baroque and Rococo style (between the 17th and 18th century). 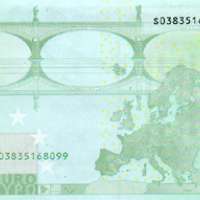 Notes printed before November 2003 bear the signature of the first president of the European Central Bank, Wim Duisenberg, who was replaced on 1 November 2003 by Jean-Claude Trichet, whose signature appears on issues from November 2003 to March 2012. * W, K and J have been reserved for EU members currently not participating in the euro. R reserved for Luxembourg which curent uses stockprinted originaly for other countries.